Check this out... Former Haiti opposition senator Moise Jean-Charles says he plans to go to the elections BUT NOT with Martelly as President... Moise says: "Will sit down with the CEP at a favorable moment... Elections CANNOT be held with out Platfom Pitit Desalin..."
New Haiti Government System: President, Vice President, Single Legislative Chamber, What do you think? Haiti Senator Francois Annick Joseph speaks of a secret plot to change Haiti's system of government and turn it into a President / Vice-President system, instead of a prime minister, and replace the Senate and Chamber of deputes into a single legislative chamber... Is that GOOD or BAD? 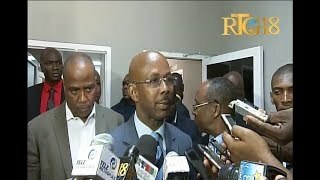 "Eske Prezidan Martelly te janm gen dan nan bouch li?" Se sa Senatè Francois Anick Joseph te mande sou antenn radio Magik9, jounen Jeudi 18 Desanm 2014 la, apre jounalis la te di li: "Yo retire tout dan nan bouch li [Prezidan Martelly], Lamothe ale, gen yon seri de moun nan CEP li te mete, li di yo f-on tchoula kò nou..."
Following the resignation of Haitian Prime Minister Laurent Lamothe, political Activist attorney Andre Michel says "Too little Too late... President Michel Martelly MUST GO... This is the WILL of the people..."